Mercedes already talked about the release of C43 AMG 4Matic Coupe at the Geneva Motor Show, but no one knew that at the very same day they’ll also unveil the Mercedes - Benz C43 AMG 4Matic Cabriolet 2017. Yes the convertible version of the Coupe took all the gleams with its power figures and the looks. 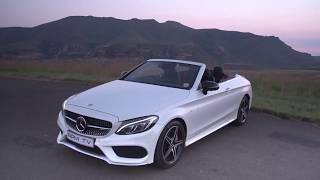 Let us have a look at the review of Mercedes - Benz C43 AMG 4Matic Cabriolet 2017 to know in detail about it. The interior of Mercedes - Benz C43 AMG 4Matic Cabriolet 2017 gets the gorgeous Artico man-made leather and Dinamica microfiber as upholstery. The two also cover the armrests, dashboard, center console, door panels and beltlines. The entire setup gets the contrast with the red stitching while the red seat belts and black floor mats further add to the gleam. Behind the multi-function flat bottom steering wheel we have the instrument cluster featuring two tube-shaped circular gauges with a 4.5 inch color display that presents all the vital information. Though the speedometer reads up to 173 mph but don’t worry if someday the pointer doesn’t touch it, as the top speed is electronically limited. The soft top can be operated till the speed of 31 mph and is available in black, brown, red and dark blue. Thus rounding up the interior details of Mercedes - Benz C43 AMG 4Matic Cabriolet 2017 all I would tag it as, gorgeous, elegant and luxurious. 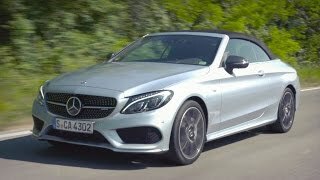 The exterior of Mercedes - Benz C43 AMG 4Matic Cabriolet 2017 is very much similar to the Coupe sibling. Starting with the front fascia, we have almost the same set up apart from the corner vents and mesh filled air dam. Looking through the sides the model has light-alloy wheels that feature chrome trim and the same essence further can be noticed over the waistline till the drop top roof. At the rear end there are certain changes. The short deck lid has sufficient space for the cargo and the roof. The model might be a carry forward of the Coupe sibling but by maintaining the sportier appearance they have commendably gained accolades. Thus rounding up the exterior details of Mercedes - Benz C43 AMG 4Matic Cabriolet 2017 I would simply call it elegant yet sportive. 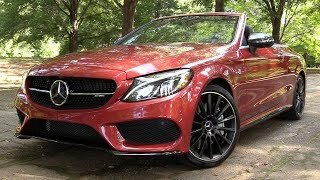 Beneath the hood of Mercedes - Benz C43 AMG 4Matic Cabriolet 2017 sits a 3.0 liter V6 engine that cranks total output of 362 hp and peak torque of 520 nm mating to 9G-TRONIC automatic transmission. The engine enables the model to sprint from 0-60 mph in just 4.7 seconds while the top speed of Mercedes - Benz C43 AMG 4Matic Cabriolet 2017 touches the mark of 155 mph (electronically limited).